Roughly 400 people attended the town meeting on Monday evening. 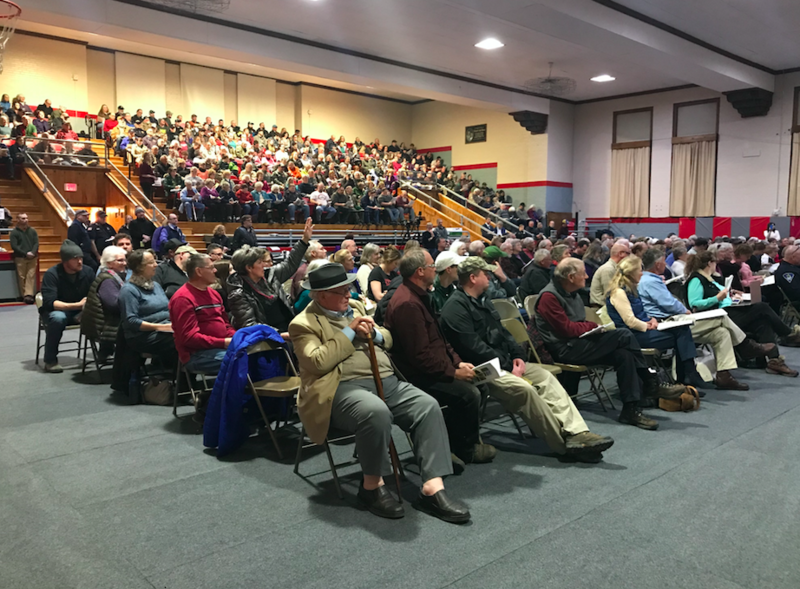 FARMINGTON - The annual town meeting drew a crowd of roughly 400 local and state-wide residents to the Community Center Monday night, primarily to participate in a discussion about the proposed New England Clean Energy Connect project. In the end, voters opted to oppose the proposed transmission line, telling selectmen to rescind a previously-issued letter of support. 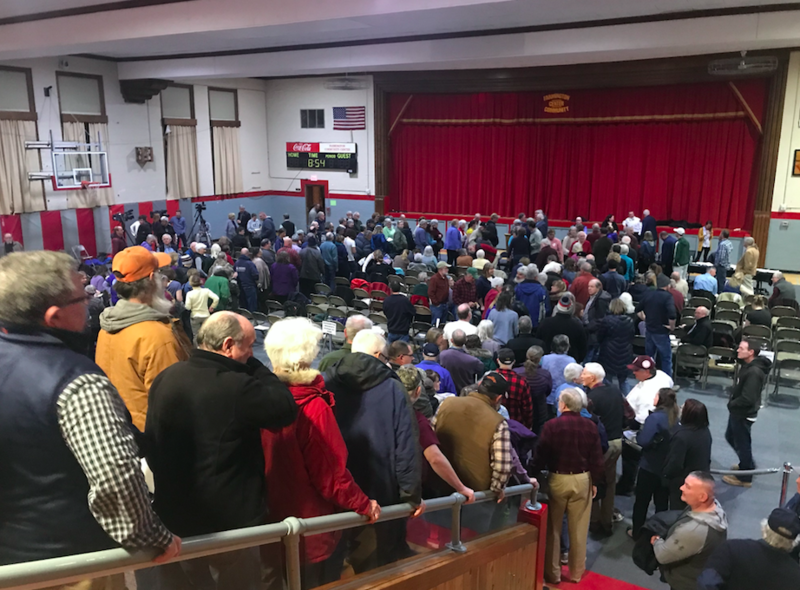 Many spoke in opposition to the project, saying that it would damage the western Maine wilderness, that they were skeptical of Central Maine Power and of the benefits that Maine would get from NECEC. "What we're going to get is pitiful. It's shameful. We are not going to benefit from this and we all know that," Farmington resident Jon Bubier said. A few spoke in favor of the project, saying that it's time to stop relying on fossil fuels and questioning the authenticity of the "Stop the Corridor" collaboration. "I'm not asking you to vote for this because it's the perfect solution," Governor Janet Mills said to the crowd. "I'm asking you not to vote for the slickest ads. Put aside the hype, the ads, the flyers and consider the facts." More than 50 people attended the meeting from other towns, primarily those that would host the proposed 145-mile long transmission line. "We the people of Maine, not just Farmington, are affected by this. We are the experts of this state. We know what we need," Caratunk resident Kim Lyman said to the crowd. Voters supported having selectmen rescind the letter of support and take a position in opposition to the project. The article was moved to a secret ballot vote and passed 262 to 102. In other town business, Selectmen Joshua Bell and Michael Fogg ran unopposed and won three-year terms on the Board of Selectmen, while incumbent Director Douglas Dunlap and Isaac Raymond ran and won for two, three-year terms on the Regional School Unit 9 board. Newly elected Dennis O'Neil was elected to a two-year term on the RSU 9 board. Two outside agency funding articles, Article 25 and 26, both passed. They addressed the support of outside agencies that were previously funded through the county budget process. Voters supported a resolution that asks the County Commissioners to restore funding at the county level for the social service agencies previously cut. A follow-up article approved an amount of $18,000 to be divided up among those agencies. That number represents Farmington's previous contribution, through the county process, to those agencies. Article 43 and 44 both related to "Adult Use and Medical Marijuana Stores, Cultivation Facilities, Manufacturing Facilities, and Testing Facilities," an ordinance that would limit new businesses from opening in residential districts as well as the Village Business Historic District, which consists of the majority of Front Street, Broadway from High Street down and Main Street from Anson Street to Academy Street. The ordinance was passed by voters. As proposed by the selectmen and Budget Committee, the town budget would be set at $6.1 million for the 2019-20 year, representing an increase of 5.5 percent. Residents in line for the NECEC vote. Who knows why.. but ask Bob, he seems to know how she thinks. If it's managed by humans, Maybe some is misused. But maybe not. I believe in the hand "up" versus hand out scenario. I guess most people do. Hey,,, congrats to Capt Planet for making me laugh very hard with his earlier short comment...funny. Thanks for the lesson Eddie, much appreciated!